"My sobriety will not and I repeat not knock off my sarcasm...if anything....it will intensify....I appreciate the support from my brother and family.....kicked dope and crack by myself...but I need help on this one....so all your thoughts and prayers are more than welcome......thanx !" Jourgensen has been very candid about his drug and alcohol use (and other debauchery!) 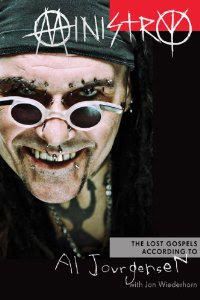 in interviews and his recent autobiography Ministry: The Lost Gospels According to Al Jourgensen.